It never fails that when my five year-old borrows a book from his school’s library it’s about whales or dolphins. Feeding the belugas and watching the orcas at Canada’s Marineland was the highlight of our family vacation. 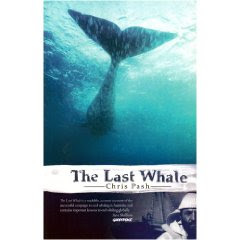 So when I had the opportunity to review The Last Whale by Chris Pash, I was thrilled. The minute I began reading it, I had flashbacks of the movie Free Willy 3: The Rescue, where whalers illegally hunted killer whales. The Last Whale, though, is the incredible story of how whaling came to an end in Australia, the last of the English-speaking countries to do so in 1978. The author says he was a pimply reporter at the time (1977), when activists launched Greenpeace’s first direct action in Australia. This small group of men and women risked their lives as they daily went out in open dinghies (Zodiacs), and became a human shield between the whales and the towering steel ships. They braved the rough Southern Ocean, the blistering sun, flying harpoons, and endless hours miles away from land in water that was also home to great white sharks. The threat of their appearance was real every time a whale was killed and its blood spilled. What I loved most about this well-told story was that the author gave us a detailed account relating not only the actions and feelings of the anti-whaling activists, but also the fears, motives and actions of the whalers. We get a chance to know their story and their history as some of the whalers learned their trade from their fathers who in turn learned from their fathers. It is a story about Albany, the town where it all took place, whose port is one of the five largest in the world, and the unemployment rate one of the highest in Australia. The struggle they all faced with the ethical issue of whether it is right or wrong to hunt whales was clear, and it needed to be addressed. The world took notice, and the small band of activists soon had many allies. Although the book is a non-fiction account, it reads like a novel thanks to Pash’s writing skills. I felt I was in Western Australia in the seventies watching the fight unfold before me. The black and white photographs add drama to the account as we could see exactly what a whale chaser looked like with a loaded harpoon gun at its helm, or the upclose face shot of The Phantom—as one of the leading activists was known—as he sits in the open seas with a chaser seen clearly behind him. And the book’s cover is so attractive. It led me to really want to read this account. By the end of the book, I wanted to meet some of these interesting folk, both from the activist and whaler groups. I highly recommend this book to conservation groups, whale and animal lovers, activists, journalists, and just about anyone who loves happy endings. It is an inspiring tale. One that will surely come to mind when next summer I visit Tadoussac in my own province of Quebec, where the mouth of the St-Lawrence River opens invitingly to welcome back the migrating whales—those beautiful ocean creatures that fascinate both young and old alike. Disclosure: This book was sent to me by Chris Pash for the purpose of reviewing it. I was not compensated in any other way, nor told how to rate or review this product. Sounds like an interesting book. Great review.